This project was initiated by Lex Heerma van Voss, Els Hiemstra-Kuperus and myself at the International Institute of Social History (IISH, Amsterdam, The Netherlands) in the early 2000s. The aim was to take stock of the work done on textile workers worldwide and to compare their history in a systematically comparative manner over a period of 350 years. To realize this broad comparison, the project followed the approach of an earlier comparative project on the history of dock workers. The model that was applied for this collaborative research project has also been called ‘the collective model’. In the first stage various specialists were asked to write ‘national’ histories on textile workers in different countries covering the period 1650– 2000. This method has an advantage over having one historian or a small team doing comparative work on a number of countries in that it can build on a wide range of existing expertise. However, if one asks experts from different national historiographies to write on the area of their expertise, contributions tend to have their own focus and questions. To reach a satisfactory degree of comparability, the authors of the national histories were thus requested to follow a questionnaire, which we called the ‘framework document’. This listed a number of topics and questions to be studied in each overview. The second stage consisted of comparative studies that were written on the basis of the national histories. In some cases, we asked external specialists to write these comparative overviews, in other cases we asked authors from the national overviews who in their paper had displayed an interest in one particular theme. The third stage was an international conference in Amsterdam in November 2004 attended by all the authors involved in the project. Here, the comparative papers were vividly discussed and useful suggestions were made for improvement of the individual papers. But, perhaps more importantly, it brought together experts and information, which stimulated all those present to think about large-scale general trends and developments in the history of textile workers. These debates made us acutely aware of the huge diversity over time and space, but it also enabled us to get a grip on various trends evident in this variety. 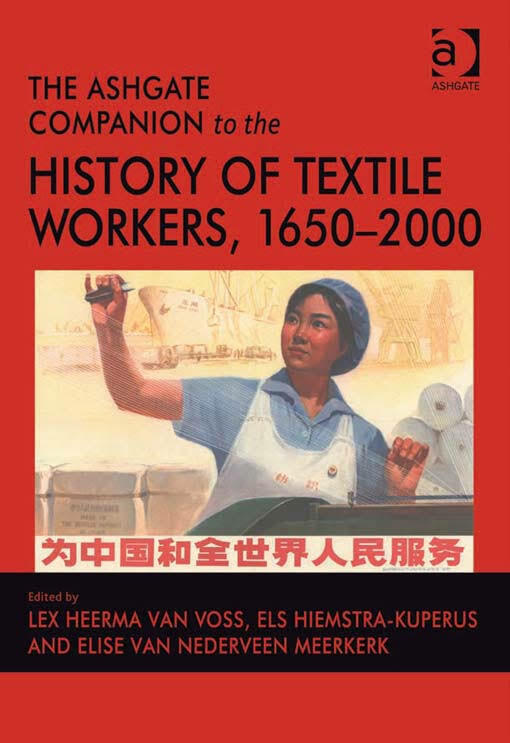 The fourth and final stage of the project consisted of the publication of a large volume on the history of textile workers, containing the national overviews, the comparative overviews, and a substantive conclusion by the editors of the volume. 2012 – Elise van Nederveen Meerkerk, ‘Fare storia globale del lavoro’, in Christian G. De Vito (red. ), Global labour history. A storia del lavoro al tempo della “globalizzazione” (Verona) 108-140. 2010 – Lex Heerma van Voss, Els Hiemstra-Kuperus and Elise van Nederveen Meerkerk (ed. ), The Ashgate Companion to the History of Textile Workers, 1650–2000 (Aldershot etc. : Ashgate).